This is a simple version of the old fairground game Hi Lo - with the Exchange twist! The rules are really simple: the computer uses the 13 Spades cards and turns them over one at a time. Prior to turning, the computer predicts whether the following card will be higher or lower than the previous one. When the computer predicts wrongly, the game ends. Your aim is to decide how far into the sequence you think the computer will get. You can place bets before the game begins and after each correctly predicted card. You're aiming to make a profit from predicting how many cards the computer will correctly predict. You can bet on card 1 or further, card 2 or further, card 3 or further and so on up to card 11 and you can bet as often as you like - for as long as each game continues. Remember, though, that you're predicting whether the computer is right or wrong i.e. it doesn't matter how you would play the game, you're basing your bets on the computer's decisions. 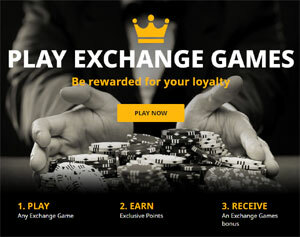 But because Exchange Games allow you to bet using betfair's innovative betting exchange, the real fun and excitement comes from knowing that you're trying to outwit other gamblers, not just a Random Number Generator! Before the game starts you can place bets on how far you feel the computer will go. A look at the chart will show that the bigger odds are to be found by betting on the computer going deep into the sequence. This isn't surprising, but if the computer does manage to get to card 5, by the time it does the odds will have come right in, so maybe now is the time to trust your hunches. There's no real strategy at this stage, it's more a matter of taking a punt and choosing one of the available options as a pure gamble. The first card is turned and the odds on each bet change instantly! Don't forget that it's not just the odds on the main bets that will have been affected, the odds on the five side bets will also now start to change, giving more betting options. This is your first real opportunity to make an informed bet - informed not so much by the odds and strategy (as in Blackjack) but by other punters' reactions to what happened. To help you make a more informed prediction as to what may happen, betfair provide a card counter that shows you which cards have already been displayed and how many cards are higher or lower than the latest one. In the example shown here, you'll see that there are 4 cards lower than the 7 of Spades, and 7 cards higher. The computer has predicted that the next card will be Higher. This again gives you an opportunity to place an informed bet, i.e. do you base it on the probability of the computer being right, or try to second guess the opinions of other gamblers, some of whom will go with the prediction, others against it. Play now continues for up to 9 more rounds, until the computer makes a wrong call. If the above has whetted your appetite, and you'd like to give Exchange Hi Lo (or any of the other Exchange Games) a spin, just click on the link below and we'll take you straight there!